This challenge is all about cans or tins - the kind in which you might buy baked beans or soup. Is there a best way to stack cans? What do different supermarkets do? Can you explain why they might stack cans in that way? How high can you safely stack the cans? 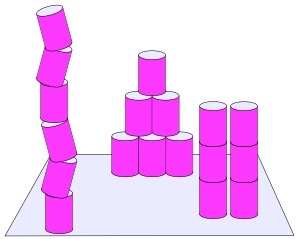 Investigate the different ways in which cans roll. Does it make a difference if the can is empty compared with when it is full? How about a partially-filled can? Practical Activity. Addition & subtraction. Visualising. Working systematically. Combinations. Interactivities. Compound transformations. Tangram. Forces. Investigations.